Burt Hall was built in 1920 and named for Mr. and Mrs. R. E. Burt, who donated the $100,000 needed to build the residence hall. Burt was architecturally ahead of its time when built. The in-suite bath design was almost unheard of for college dorm facilities and was later copied by other college architects. The three-story building was renovated in 1990 and houses 170 residents, making it the largest female hall on campus. Located just off the central quad area, Burt is convenient to Hardy Hall and Walton Chapel and is in easy walking distance to the library and all academic buildings on campus. This facility includes a large lobby with game tables and T.V. area, several study rooms adjacent to the lobby, a computer lab, vending machines, and laundry rooms where laundry can be done with no charge. Resident Assistants are assigned to each floor of the building and the Resident Director lives on-site. Building security includes a staff member on duty each evening until closing and a card access system for entry into the building after doors are locked. 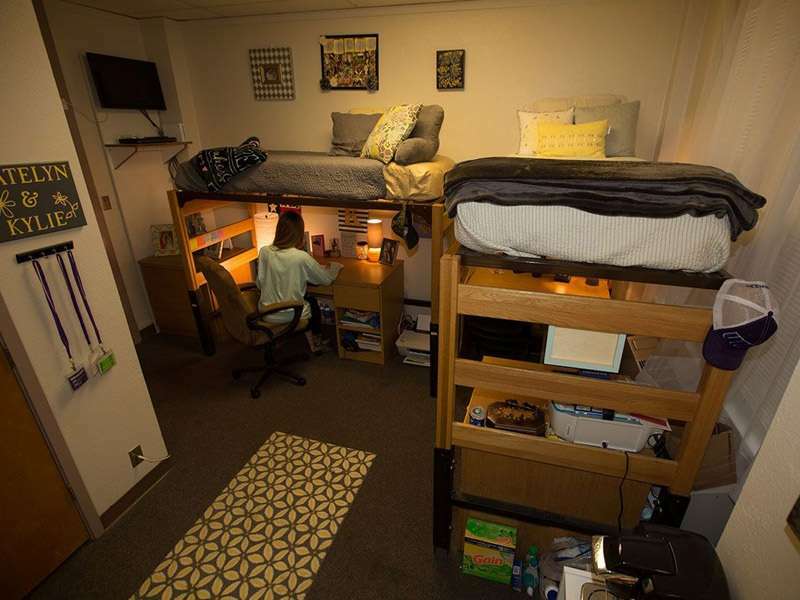 Most of the student rooms in Burt are double occupancy, but there are a small number of private rooms in the building. There is also a block of rooms within Burt set aside for applicants to the freshman honors program. Approximate room dimensions for a typical room in Burt are approximately 15' x 14' (210 sq. ft). Each room has one walk-in closet approximately 5' x 5'. Rooms are suite style and include a vanity/sink area within the room. There are two junior loft twin beds with 80" mattresses, two desks, two desk chairs, and two chest of drawers. The beds are adjustable and, when raised to the highest level, there is extra storage space under the bed. The in-suite bathroom comes with a shower and is shared with suite-mates. The standard room has two windows. Window measurements are 36" x 77" (inside casing) and 23.5" x 77" (inside casing). Mini-blinds are provided for each window. Walls are a neutral tone and most of the walls are plaster. Students must check with the hall staff before hanging anything on walls or other surfaces within the room.